The annual WCDS Spring Auction is the biggest fundraising event of the year. Proceeds from the Auction augment educational programs and support scholarships. This year we are pulling out all the stops for our 2oth Anniversary, adding a Roaring 20s Murder Mystery Dinner Theatre twist!! 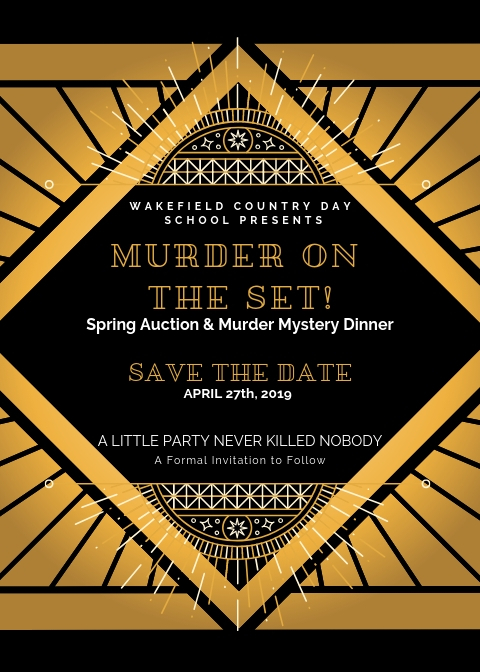 Come witness the transformation of the WCDS Gym and Auditorium into the set for a murder mystery. Theater will frame the traditional Silent and Live Auctions with a perfectly catered meal in between. Guests will be able to bid on priceless items as they enjoy the entertainment and feast on their delicious dinners and decadent desserts. The Auction is both festive and fun. Come join us and consider underwriting the event through sponsorships or donations—large or small—and don’t forget to bid on items that strike your fancy. Take a look at our online catalog now, and check back regularly for updates. The Auction this year will be an evening to remember! Preview a sampling of live and silent auction items. Advertise your business and/or sponsor a table. Our Spring Auction is successful due to the generous donations we receive. If you would like to purchase more than two tickets, please consider the sponsorship opportunities above.